By taking the very best music from a fascinating, unknown score, Opera Rara begins its new series, the Essential Opera Rara. The chosen selections contain the heart or essence of a work on a single disc of highlights. Saverio Mercadantes Zaira is the first in the series. By taking the very best music from a fascinating, unknown score, Opera Rara begins its new series, the Essential Opera Rara. The chosen selections contain the heart or essence of a work on a single disc of highlights. 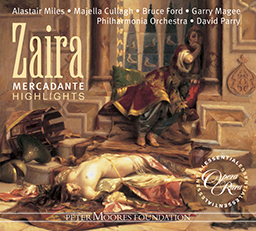 Saverio Mercadantes Zaira is the first in the series. Mercadante had spent four years writing operas in Spain and Portugal when he returned to Italy in 1831. At that time the most popular composers were Gaetano Donizetti and Vincenzo Bellini. Mercadante knew he had to compete with the dramatic genius of Donizetti and the melting lyricism of Bellini. It was, in fact, Bellini who used Felice Romani’s libretto first; written in haste, it had no success. Adapting the existing text to his own purposes, Mercadante produced something remarkable. The dramatic opportunities are seized with a sure hand and his most plangent melodies provide some of the best vocal music of his long career. All of this for the tragic story of the slave who marries a sultan. 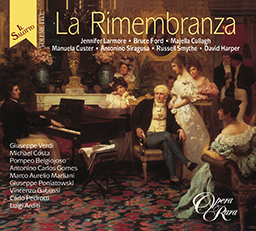 Each disc comes with a complete libretto, with English translation, giving you the opportunity to understand how the various excerpts relate to the whole. 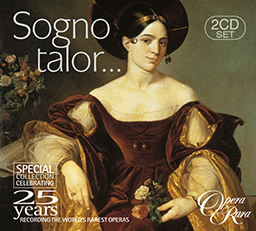 Booklet includes complete libretto, with recorded music marked in coloured text, with English translation. In the great square of Jerusalem the populace has gathered to honour their popular Sultan, Orosmane, the ‘Conqueror of Araby’. He accepts their homage, and also extends his greeting to Nerestano, a French knight who, released after many years’ captivity, has been back to France and returned with the ransom money for ten further knights. In a gesture of generosity Orosmane offers him a hundred, but excludes from the bargain the aged Christian ex-king of Jerusalem, Lusignano, and a slave girl, Zaira, whom he intends to marry. Nerestano, who had hoped to buy the freedom of both, is particularly dismayed that Zaira should be denied him. Orosmane, confident of her love, agrees to let him see her, and even agrees that she may accompany him if she is willing to do so. A magnificent atrium within the palace. Slaves dance, play harps and sing to entertain Zaira, who is joyfully looking forward to her marriage with Orosmane. Her confidante, Fatima, is a little shocked that she should so easily be brought to wed a Muslim, and to forget that she was born the daughter of a crusader, but as Zaira points out in reply, she never knew her parents or even their exact identity. Orosmane joins her, and they express their unbounded love for each other. Their happiness does not, however, long remain untroubled. Nerestano appears for his interview with Zaira and reproaches her, since she had once vowed to accompany him back to France if he could raise her ransom money. While not denying the truth of his assertion, she insists that circumstances have changed, and that her earlier vow has now given place to another. A subterranean chamber leading to the cells where the Christian prisoners – the erstwhile crusaders – are incarcerated. Nerestano greets Castiglione, his friend and former fellow-prisoner, who in turn ushers in the company of redeemed knights. All rejoice at the prospect of freedom. Zaira brings news that Orosmane has yielded to her entreaties and agreed that Lusignano should also be set free. The feeble old king is led from his cell, and Nerestano and Zaira are presented to him as his liberators. They relate how they were captured when they were children – on the very day that Cesarea fell to the Arabs – and from a pendant hanging around Zaira’s neck, Lusignano realises that they are his long-lost children. Their reunion is joyous – until Lusignano notes that Zaira is dressed in Arabian clothes. She confesses that, brought up at the Arab court, she has hitherto been a Muslim. Subjected to his bitter recriminations, she capitulates and declares her readiness to return to the Christian faith. At this point Corasmino, the Sultan’s confidant, enters to announce that Orosmane has had second thoughts: for the moment the Christian knights are to remain in captivity, while Zaira is summoned back to Orosmane’s presence. The atrium, as in Scene Two. Orosmane has yet again changed his mind. His earlier intransigence has been the result of Corasmino’s influence; now he orders that Lusignano and the French knights be set free once more, and that Zaira be granted her wish to take a last farewell of Nerestano. When brother and sister meet, Zaira learns that Lusignano is dying, brought to his grave by his grief at her apostasy. Nerestano brings all possible influence to bear upon her, urging her to reject the Sultan’s love and return to her Christian faith. As a result, when Orosmane returns and invites her to accompany him to the marriage ceremony, she hesitates and asks, since Lusignano is dying that their wedding be postponed. Orosmane agrees, but, suspicious of the role Nerestano is playing, warns him to quit Jerusalem before the following dawn. The atrium, as in Act One. Zaira, torn between her duty to return to her Christian faith and her love for Orosmane, is inclined to go to the Sultan and tell him all, but Fatima reminds her of his hatred for Lusignano and his family, and points out that she would be putting Nerestano’s life in danger. Orosmane, for his part, has been trying to come to terms with a growing suspicion that Zaira no longer loves him. He tells her that he has got the better of his passion and now feels only contempt for her. In grief, she declares her continuing love for him – but refuses to divulge the reasons she wishes to defer the wedding. Her refusal only increases Orosmane’s suspicion that she has now fallen in love with someone else. A distraught Nerestano tells Castiglione that Lusignano is no more. Apeled, one of the Sultan’s officials, brings word that Orosmane has ordered the immediate departure of the French. He wishes them out of Jerusalem this very evening, for in the morning he intends to go through with his marriage to Zaira. In yet another gesture of generosity, however, he agrees that they should have time to bury Lusignano before they leave. Corasmino tells Orosmane that a slave has been apprehended carrying a letter from Nerestano to Zaira. Opening the note, Orosmane discovers to his horror that it summons Zaira to an assignation in the harem gardens that evening, with the intention that the two of them – Nerestano and Zaira – should flee from Jerusalem together. Convinced that Nerestano must be Zaira’s lover, Orosmane reseals the letter, and orders that it be carried to its destination. A ground-floor room in the harem. Fatima brings Zaira the letter, which has been delivered by an unknown slave. Zaira is still unable to decide between her Christian duty and her love for Orosmane, but when from the window she sees Lusignano’s bier born to its resting place, she gives way to a paroxysm of self-reproach, blaming herself for her father’s death, and calling upon death to release her from her anguish. A remote part of the gardens of the harem. Orosmane lies in wait to ambush Nerestano and Zaira. He reproaches himself for behaving like a petty criminal, but when Corasmino brings word that Zaira has replied to the letter, agreeing to the assignation, his jealousy gains the upper hand. Zaira and Fatima appear, and duly meet with Nerestano, They are about to make their escape when Orosmane rushes forward and stabs Zaira. As she dies, she addresses Nerestano as ‘brother’, and for the first time Orosmane realises their true relationship. Nerestano invites him to slay him too, but, horrified at what he has done, Orosmane turns his dagger upon himself.